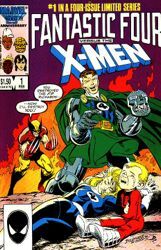 X-Men: Days of Future Past screenwriter Simon Kinberg has been doing the press rounds this past week to talk about the seventh movie in 20th Century Fox's popular franchise based on Marvel Comics' mutant heroes. Kinberg is also the writer and producer behind Fox's reboot of Marvel's The Fantastic Four, which just started filming with Josh Trank (Chronicle) behind the camera and Miles Teller, Kate Mara, Jamie Bell and Michael B. Jordan playing the superhero group family. Mike Ryan from ScreenCrush was one of many who spoke to Kinberg specifically about the Fantastic Four and while he wouldn't outright confirm that it will be an origin story, he did discuss the challenges of rebooting the characters, a similar problem faced by the makers of The Amazing Spider-Man, as well as whether the movie takes place in the same universe as the X-Men movies. 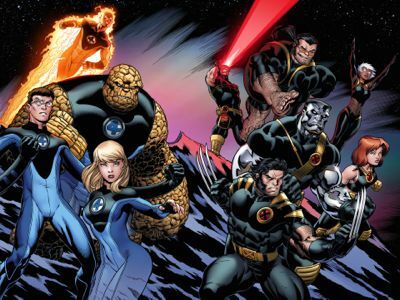 Kinberg admits that the latter question is complicated, because nothing has been established in any of the previous "Fantastic Four" movies that mutants exist and vice versa. "None of the X-Men movies have acknowledged the notion of a sort of superhero team–the Fantastic Four–and the Fantastic Four acquire powers, so for them to live in a world where mutants are prevalent is kind of complicated, because you’re like, 'Oh, you’re just a mutant. What’s so fantastic about you?' No, they live in discrete universes." As far as rebooting the Fantastic Four so soon after the other movies, he compared it to the recent reboot of Spider-Man at Sony, while vaguely admitting it's not as big an issue since they're rebooting characters that previously had issues when last brought to the screen. "People have a very different relationship to the Fantastic Four movies than they had to Raimi’s Spider-Man movies. Raimi’s first Spider-Man movie is a beloved movie that sort of redefined, tonally, sort of what comic book movies could do, so rebooting a movie that was beloved less than ten years after it had come out is challenging. We approach ‘Fantastic Four’ with a different set of challenges." Lastly, Kinberg talked a little more at length about the tone of their Fantastic Four. "Our version, the ‘Fantastic Four’ movie we’re making differs than those other films. Where I think superhero movies define themselves is not in plot and character, but in tone, and the tone of our ‘Fantastic Four’ movie is so different than those other films, and I actually think, more importantly, different from other superhero movies." "It’s like, there’s a spectrum, tonally, from like Raimi’s ‘Spider-Man’ to Josh Trank’s ‘Chronicle’ movie," he continued. "We’re on the spectrum, but between those two movies. I don’t know where the needle turns, but we are in-between those films. On the other side of ‘Chronicle’ is probably like, ‘X-Men’ is around there with the darkness, and then ‘The Dark Knight’ is the darkest. And on the other side is ‘Spider-Man’ — the original ‘Fantastic Four’ movies are probably on the other side of the goofiness. So, we’re somewhere in-between the joyfulness of Raimi’s ‘Spider-Man’ movies and the reality and drama of Josh’s ‘Chronicle.'" You can look for more from SuperHeroHype's own interviews with Kinberg and the cast and crew of X-Men: Days of Future Past before it opens on May 23.